Defence Secretary Gavin Williamson has announced that 2,000 organisations have now signed the Armed Forces Covenant. Defence Secretary Gavin Williamson and O2 Chief Executive Mark Evans sign the Armed Forces Covenant. The news comes after a record breaking year for the Armed Forces Covenant with more employers signing up in a single year than ever before. O2 is the latest employer to sign the Armed Forces Covenant, bringing the total number of signatories up to 2,000. 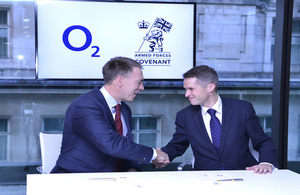 Today, Defence Secretary Gavin Williamson and O2’s CEO Mark Evans co-signed the Covenant at a ceremony in London. The Armed Forces Covenant Annual Report 2017 by the Ministry of Defence was also published today, looking back at the achievements of this year. Among O2’s pledges of support for members of the Armed Forces and their families, O2 is offering paid leave for Reservists to complete their annual training as well as suspension of their mobile phone contracts in the event of deployment. As part of their pledge to support Veterans and Cadets, O2 are offering them access to their WAYRA initiative. WAYRA is a world-leading start-up accelerator programme which takes between nine and 12 entrepreneurs for a nine month period in London, Oldham, and Birmingham to develop their business ideas. By signing the Armed Forces Covenant, O2 joins large and small organisations across the country who are helping to ensure that current and ex-Forces personnel and their families get a fair deal when accessing goods and services as well as equal opportunity when transitioning to civilian jobs. We deeply value those who courageously serve our country with great pride and dedication. This landmark signing of the Armed Forces Covenant demonstrates our continued commitment to them. O2 championing our service personnel reflects the real value Reservists and Veterans can bring to business. I hope their pledge today will encourage others to sign up. Britain prides itself on the professionalism of our Armed Forces, who are the best in the world. The transferrable skills they take into civilian life are phenomenal. They are natural leaders, can work in a team, are disciplined, reliable, committed, brave and extremely well trained. These attributes are not lost when veterans hand in their uniform for the last time, and I would encourage any organisation to reflect on the value veterans can bring to their business. 18 December 2017 First published.